Symphoricarpos albus is a shrub to 1 m tall, branching opposite, twigs thin, bark shreddy, much like S. orbiculatus but pith becoming hollow. Leaves opposite, egg-shaped to oval, 2-3 cm. Flowers pink, bell-shaped, 4-5 lobed, calyx very short, inflorescence of pairs or a few together, to 0.8 cm; blooms May-July. 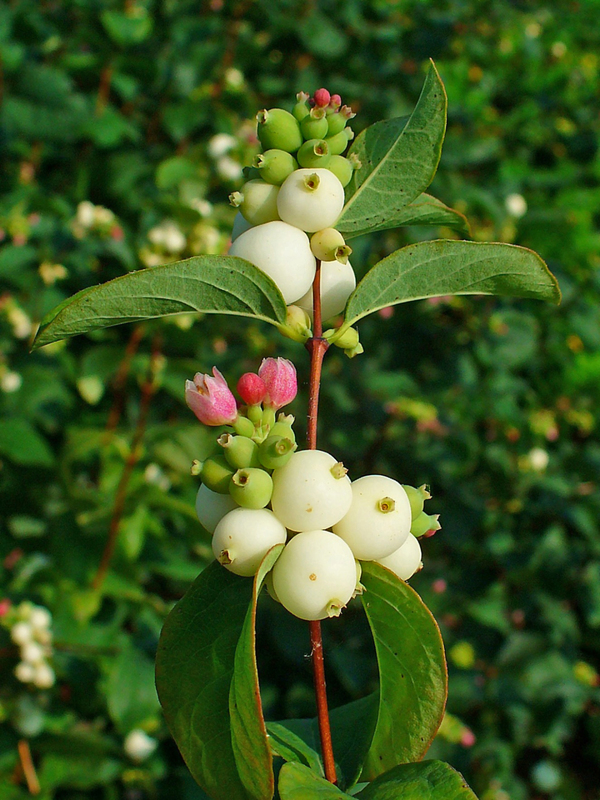 Fruit fleshy, white, a drupe, to 1.5 cm wide, with 2 seeds, old calyx persistent at top, Aug.-Oct, often persistent into winter. Origin: Most of ours are the variety native to the Pacific coast (var. alba is native to NYS) Escaped from cultivation. Habitat: Edges, degraded woodlands. Shade tolerant, drought tolerant. Notes: Infected by: Microsphaera symphoricarpi, (Ascomycotina) a powdery mildew; Glomerella cingulata (Ascomycotina), which causes anthracnose dieback, (Sinclair et al. 1987). Leaves attacked by the leafmining fly larva Paraphytomyza cornigera (Johnson and Lyon 1991).